Objective: In this unit, you will develop the knowledge and skill to obtain traffic advisories from an ATC radar controller, enter Class Charlie airspace, and land at a Class Charlie airport. Establish communication with a radar controller while in the outer area of Class C airspace. Obtain a hand-off from the radar controller to the tower controller, receiving a landing clearance, land, and obtain a taxi clearance. Use the Los Angeles Sectional and a plotter (or SkyVector) to determine the magnetic course and distance from Santa Paula (KSZP) to Santa Barbara (KSBA). Determine the highway that follows the coastline between Ventura and Santa Barbara. Determine the amount of time it will take to fly from KSZP to KSBA. Establishing communication prior to entering Class C airspace is exactly like requesting traffic advisories from approach control. You’ll initiate contact with ATC by providing the four W’s (who, who, where, what). Santa Barbara Approach, Cessna 123AB is a Cessna 172, 20 miles to the east of Santa Barbara at 4,500, full stop at Santa Barbara with Information Charlie. Note that you’d already need to obtain the ATIS prior to contacting ATC in this example of an initial call-up. This is a good practice when you’re only 20 miles from your destination as it will reduce the radio workload once communication is established. Its also possible that the controller will ‘miss’ that you have the ATIS and will ask you again later. There are six ‘pieces’ of information in the initial call-up – a lot of information for a controller to keep in short-term memory. You’ll be given a transponder squawk code, then radar identified, and finally be given the Santa Barbara altimeter setting and asked to ‘Say Altitude’. After this sequence is complete, you’ll be given an arrival route instruction. At Santa Barbara, Highway 101 conveniently leads aircraft from the east to the airport, so its used an arrival route. You will hear the controller say. Cessna 123AB, join the 101. If you’re not expecting this, you probably won’t understand it. If that’s the case, ask the controller for clarification. If you do understand it, readback the instruction and comply. You won’t hear any further communication from the controller until the hand-off to tower unless the controller issues you traffic advisory, safety alert or altitude restriction. Cessna 123AB is descending for Santa Barbara. Readback this instruction and contact the tower. Santa Barbara Tower, Cessna 123AB is 10 miles to the east, Information Charlie, full stop. If the winds are favorable, you’ll likely be told to make straight in to runway 25. Cessna 123AB, make straight in runway 25, report 3 miles. Cessna 123AB, 3 mile final, runway 25. Tower will then issue you you’re landing clearance. Cessna 123AB, winds are 180 at 6, runway 25, cleared to land. Readback the landing clearance, land, and exit the runway at the first possible taxiway. As you are planning to park at the FBO on the southeast side of the airport, exit to the left. Call the tower when off the runway and across the hold short line. Cessna 123AB is clear of runway 25 at Foxtrot, request taxi to transient parking on the southeast ramp. Cessna 123AB, taxi to transient parking via Alpha, hold short of 15R and 15L. Cessna 123AB is holding short of runway 15R for transient parking. Cessna 123AB, cross runway 15R and 15L. Readback this instruction and continue to taxi to transient. 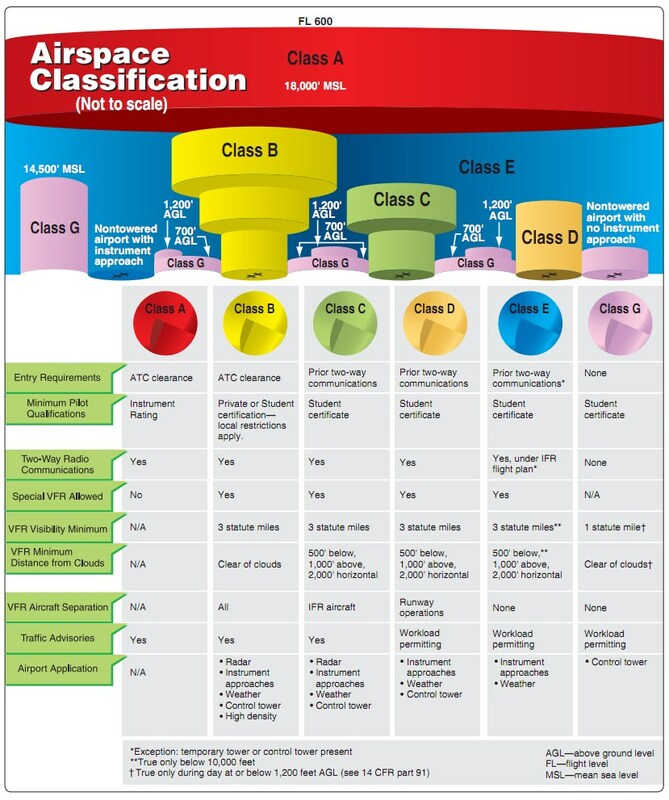 Class C Airspace is generally airspace from the surface to 4,000 feet above the airport elevation (charted in MSL) surrounding those airports that have an operational control tower, are serviced by a radar approach control, and have a certain number of IFR operations or passenger enplanements. 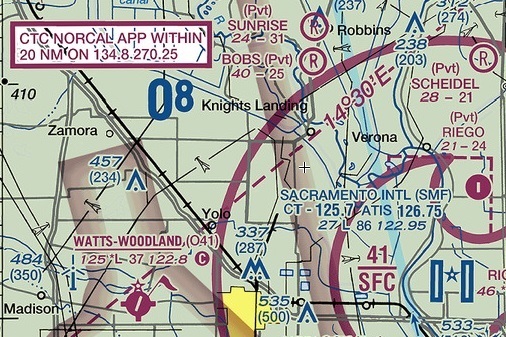 Class C Airspace is indicated by a solid magenta line. Although the configuration of each Class C area is individually tailored, the airspace usually consists of a surface area with a five NM radius, an outer circle with a ten NM radius that extends from 1,200 feet to 4,000 feet above the airport elevation, and an outer area. You’re unlikely to come across a textbook Class Charlie airspace; instead you’ll find many variations due to terrain, other airports and nearby airspace. For this reason, the MSL altitudes of both the floor and ceiling of surface area and shelf is depicted on the chart. 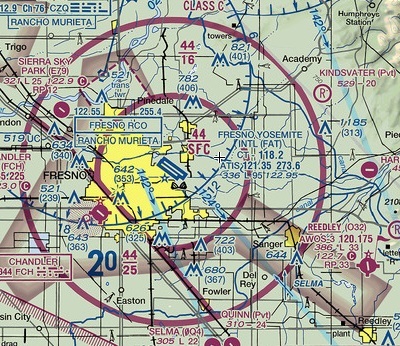 The outer area extends approximately 20 miles from the primary Class C airspace. 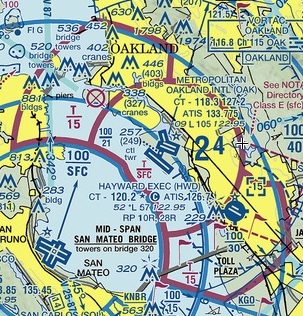 Class C airspace service is provided in this area, and this you should initiate contact with ATC when entering this area to obtain traffic advisory service, even if you are not planning to land at Class C airport, or any airport within the lateral boundaries of the outer area. Obtaining traffic advisory services gives ATC more information about your intentions, verifies your Mode C readout and gives ATC more flexibility in routing IFR traffic in and out of the Class C airport. The outer area is loosely identified on the chart by magenta bordered white box that provides the name of the ATC facility and frequencies to use to establish communication with the facility. As Class Charlie airspace is controlled airspace, the standard 3 mile visibility and 1,000 ft above, 500 ft below, 2000 ft horizontal cloud clearance requirements apply. In order to provide these services, ATC must be able to communicate with all aircraft operating in the Class C airspace. This creates a requirement for aircraft to be equipped with a two-way radio, and for pilots to establish and maintain communication while operating in Class C airspace. In addition to the two-way radio needed to establish and maintain communication, aircraft operating in and above Class C airspace must also be equipped with an operating Mode C transponder to provide ATC with altitude information. 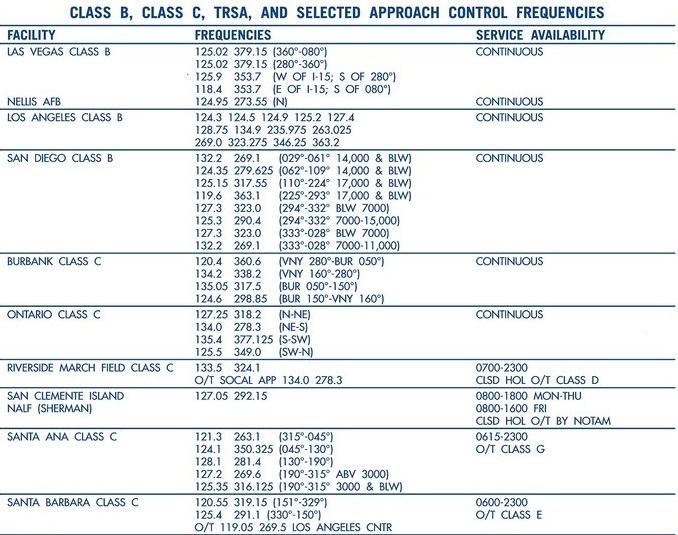 Sectional charts will include a table along the edge of the chart that provides the names, time of use and frequencies for all Class B, C, TRSA and approach controls that are included in the airspace depicted on the chart. This is helpful to understand when airspace is active, and which frequencies should be used to contact ATC. MTRs are routes used by military aircraft to maintain proficiency in tactical flying. These routes are usually established below 10,000 feet MSL for operations at speeds in excess of 250 knots. Some route segments may be defined at higher altitudes for purposes of route continuity. MTRs are identified on sectional charts as a grey lines. Routes are identified as IFR (IR), and VFR (VR), followed by a number. MTRs with no segment above 1,500 feet AGL are identified by four number characters (e.g., VR1256). MTRs that include one or more segments above 1,500 feet AGL are identified by three number characters (e.g., IR203). A “hot spot” is a runway safety related problem area on an airport that presents increased risk during surface operations. Typically it is a complex or confusing taxiway/taxiway or taxiway/runway intersection. The area of increased risk has either a history of or potential for runway incursions or surface incidents, due to a variety of causes, such as but not limited to: airport layout, traffic flow, airport marking, signage and lighting, situational awareness, and training. Hot spots are depicted on airport diagrams as open circles or polygons designated as “HS 1”, “HS 2”, etc. 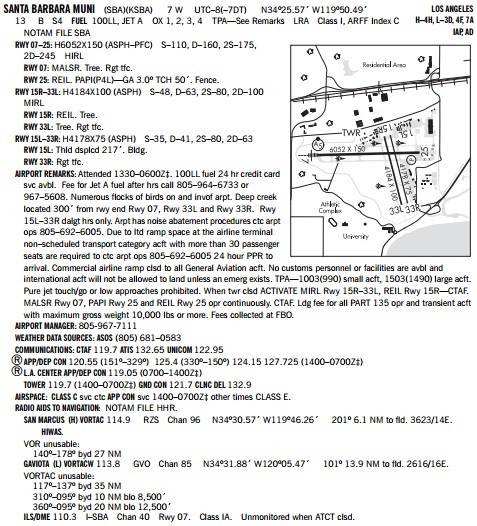 Just before the airport diagram section in the Airport/Facility Directory, the Hot Spots section includes descriptions of all hot spots depicted on airport diagrams included in the directory. Here are the hot spot descriptions for Santa Barbara. Prior to operating at an airport with hot spots, you need to research these hot spots to ensure that you learn the lesson from other pilots’ mistakes. Examine Santa Paula (KSZP) and Santa Barbara (KSBA) airports on the Los Angeles Sectional chart and Southwest US A/FD and answer these question below. What type of airport is Santa Paula airport? What is the field elevation of Santa Paula airport? What is the traffic pattern altitude at Santa Paula airport? What is the length of the longest runway at Santa Paula airport? 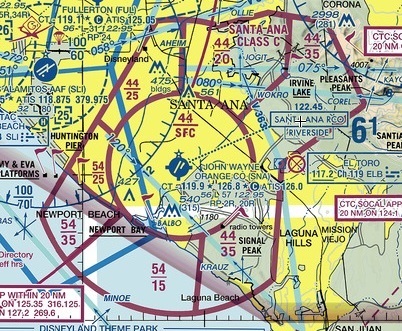 What is the CTAF frequency at Santa Paula airport? 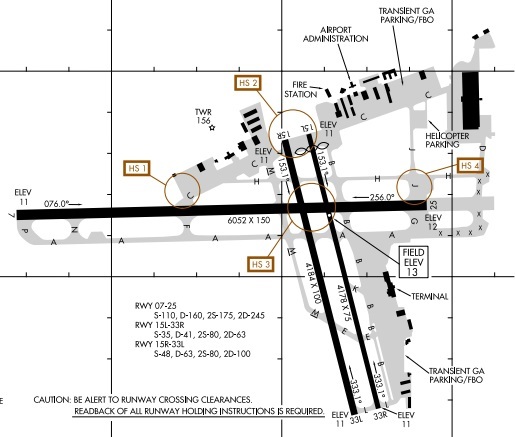 What are the runway identifiers and traffic pattern directions at Santa Paula airport? What type of visual glideslope indicators does each runway have? What is the floor of this airspace? Which frequency will you use to establish with communication with Santa Barbara Approach Control, and when will you initiate communication? What type of airspace is between KSZP and KSBA? What type of airport is Santa Barbara airport? 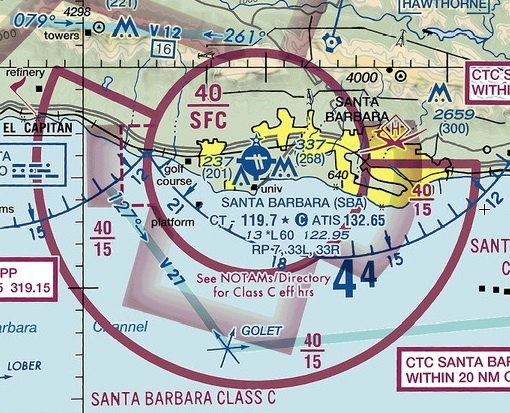 What are the ATIS, CT and Ground frequencies at Santa Barbara? What type of visual glideslope indicator does runway 25 provide? What are the runways lengths at Santa Barbara? What is the field elevation of Santa Barbara airport? Obtain the METAR for Camarillo (KCMA) as Santa Paula does not have an AWOS, and the METAR and TAF for Santa Barbara (KSBA) at http://www.aviationweather.gov. 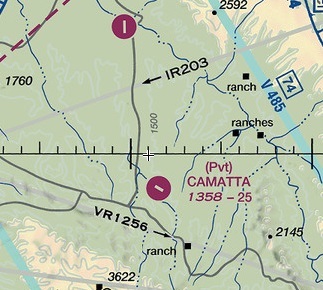 Select ‘Cessna 172 – KSZP – North Ramp’ flight file. Print and review the KSBA airport diagram so that you can comply with taxi instructions to transient parking after landing. Enter the KSZP CTAF frequency into the Comm 1 Radio. Broadcast the taxi announcement on the CTAF. Taxi to runway that is best aligned into the wind. Perform a collision avoidance scan to ensure the runway is clear at all air and ground incursion points. Make departure announcement, enter runway and takeoff. After departing the traffic pattern, turn on course and continue to climb to your cruise altitude. Obtain the Santa Barbara ATIS. Contact Santa Barbara Approach after passing Lake Casitas (approx 20 NM from KSBA). Be sure to communicate your intentions ‘landing Santa Barbara’ and the ATIS identifier. Comply with hand-offs to Santa Barbara tower. Comply with the traffic pattern entry instruction from Santa Barbara tower. Request taxi to transient on the southeast side of the airport. Expect that you’ll be told to hold short of the intersecting runways (15/33). Reflect on the sequences of communication needed to enter Class Charlie airspace.